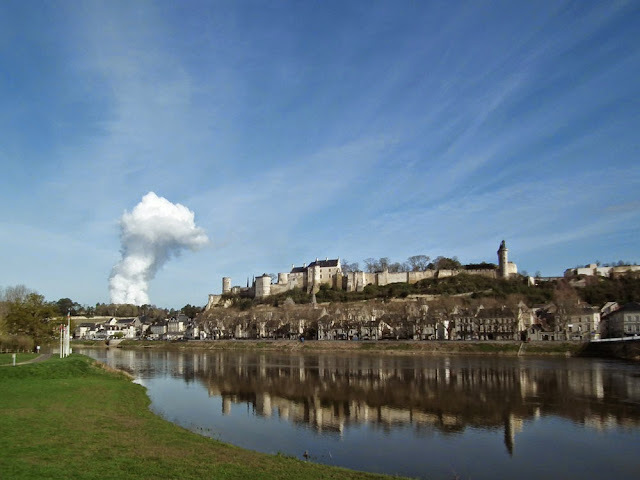 I regularly get to see the steam plumes of the nuclear power plant near Chinon. They are visible from a long way away and from lots of vantage points. Colin and Elizabeth visited the facility itself last year. taken through Célestine's window as we drove past. 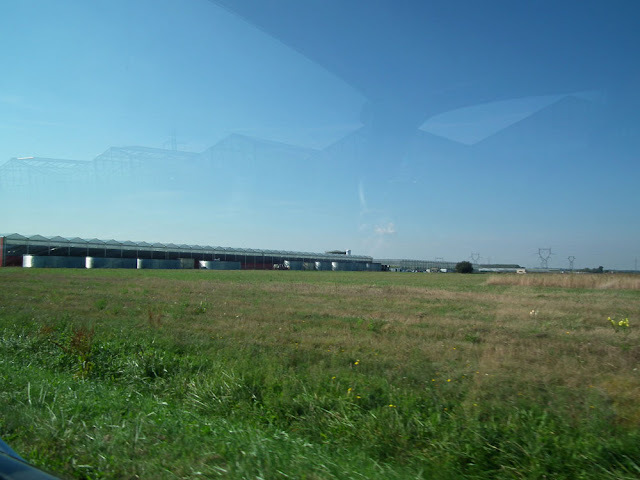 When you drive past the perimeter of the nuclear facility you can't fail to notice an enormous greenhouse right next door. Aha! I thought, I know how this works -- they'll be growing tomatoes and using the warm water from the power station cooling towers to heat the greenhouses. A bit of research on the internet and I was proved right. Not only that, but I realised that I've regularly eaten the tomatoes from this place -- and they are delicious (but not cheap)! The beautiful cherry tomatoes from these greenhouses sell at the market for around €16 per kilo, and they can't keep up with the demand for them. The steam from the cooling towers viewed from Chinon. 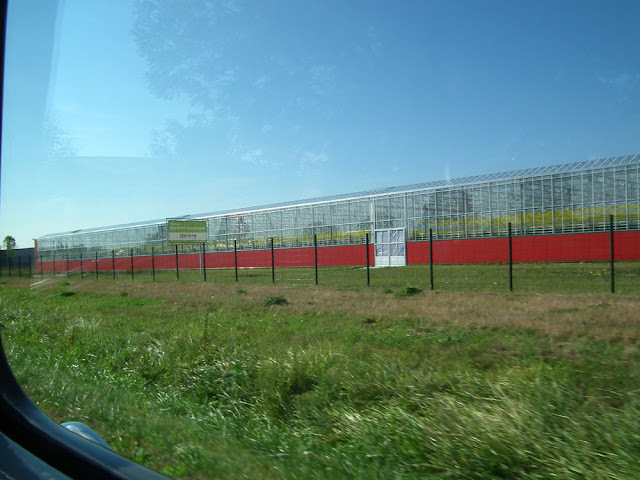 The Jardin de Rabelais deliberately installed their greenhouses within a couple of hundred metres of the nuclear facility, in order to take advantage of the warm water. According to the greenhouse manager it enables them to save 30% by volume in gas for heating. But they are not relying on the nuclear facility being there forever. They are already experimenting with a methanol plant to produce their own electricity and help heat the greenhouses and ultimately will be self-sufficient. They admit that the situation as it is today though, with their access and proximity to the nuclear plant does give them a competitive edge. 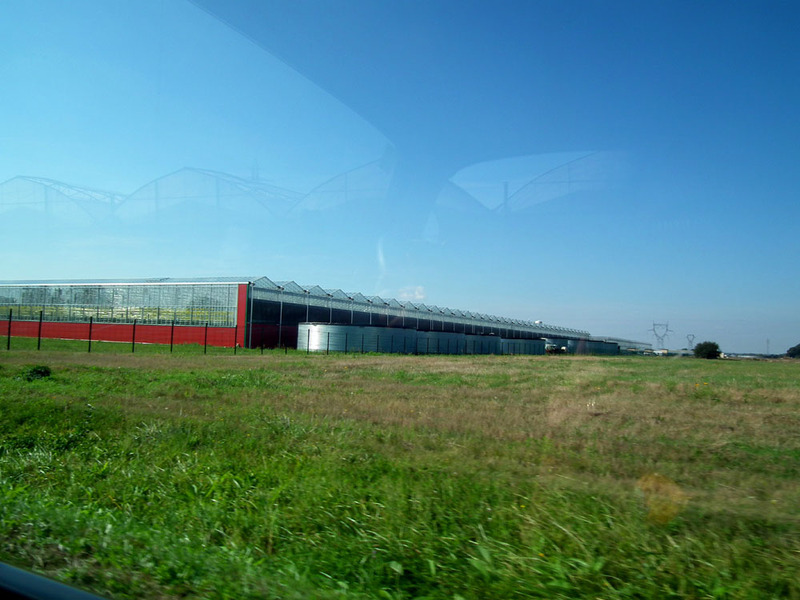 The Jardin de Rabelais greenhouses. The company is family run, and they know that if they supply the best product, the average French consumer, knowledgeable and food conscious as they are, will buy it. 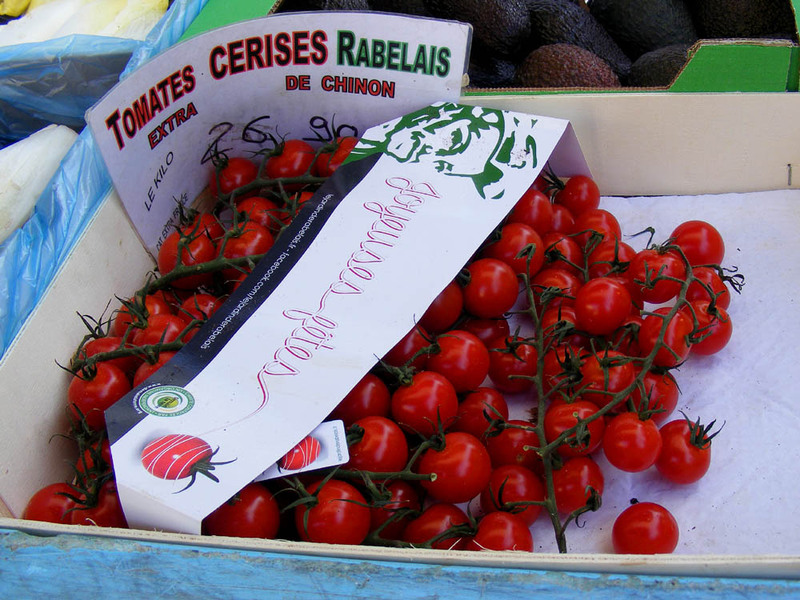 The family has been market gardening for a hundred years and they expect tomato production at the Jardin de Rabelais to hit 4000 tonnes next year. 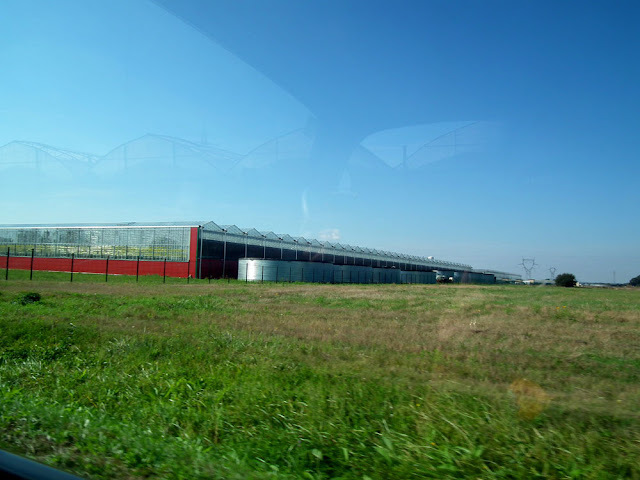 Earlier this year the Jardin de Rabelais invested 25 million to enlarge its greenhouses on the site and the extra 20 hectares ajoining that they've recently bought. 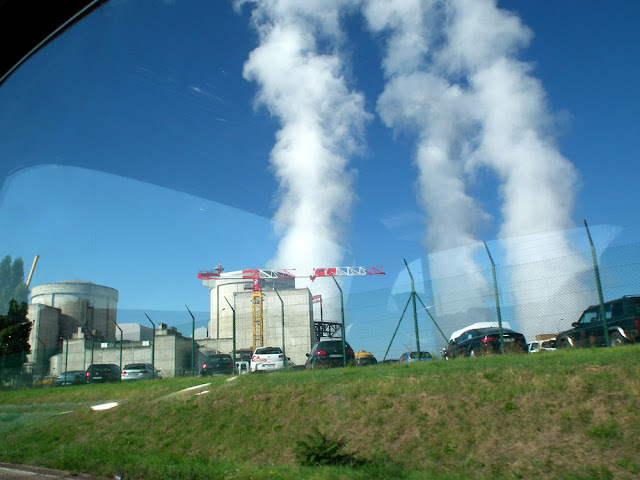 The water from the cooling towers is piped to them at 40°C. It provides half their heating at very little cost. Their giant new 3.4ha greenhouse has 14000 LED lamps to provide daylight conditions to produce all year, and especially in winter. The greenhouse roof is made of a new type of glass which allows the natural and artificial light to blend and diffuse in a natural way. The tomatoes are grown in a hydroponic medium. The new greenhouse is a world first, made by Certhon. The Jardin de Rabelais specified a number of criteria and Certhon met the brief, creating a greenhouse in which temperature and humidity can be minutely controlled to give the tomatoes the perfect microclimate. There are air ducts under the gutters and heating blocks and bidirectional fans in the end gable wall which can bring in air from outside or evacuate air from inside (or a combination of the two). The new greenhouse saves 30% of the energy that would be used in a conventional greenhouse of the same size and height. They are aiming for the export market now, which only represents 15% of sales at the moment. They currently employ 200 people and plan to hire 40 more. This is not an automated business -- tomatoes don't like being bounced around by machines. They also employ a flock of bumble bees. These bees are breed in captivity to provide ecological services to greenhouses like this. Tomatoes can self-fertilize, but they produce much more fruit if they are pollinated by the bumble bees, who use a technique known as 'buzz pollination' to vibrate the pollen off the flower and on to the bee. Covered in pollen they then transfer some of it to the next flower they visit, thus cross fertilizing the flowers. And the greenhouses from another side. The business has grown from grossing 11.5 million euros in 2011 to 20 million in 2015. The French Ministry for Agriculture figures show that total French tomato production in 2015 was 615 580 tonnes, 98% of which are grown under glass. And for those of you wondering why the business is called the Jardin de Rabelais it is because the writer and gourmand Rabelais' home is not far away. I wanted to included a photo of the tomatoes themselves, but I haven't seen them for a couple of weeks. Update: I now have a photo of some of their cherry tomatoes for sale at the market in Preuilly. Loire Valley Nature: An entry has been added for the reputedly delicious Wild Strawberry Fragaria vesca. A la cuisine hier: Simon's macaroni cheese from the freezer, with a green salad. I made lemon and walnut biscotti, from Ursula Ferrigno's 'Bringing Italy Home', given to me by former boss Merlin (yes, that is his real name). I had some lemons that needed using and I've nearly finished last years walnuts. Mind you, I may regret using all last years walnuts, as this years walnuts don't look to be any good. I'm using a very fine stoneground flour from a mill in Berry at the moment and I'm finding that doughs like the biscotti are coming out a bit wet. I'm fairly sure it's the flour and not the recipes. Bambi burgers (aka venison burgers, supplied by Niall and Antoinette after their October trip to Scotland), creamed chard and mashed potatoes. We really like the venison burgers and will definitely be ordering those again. Sod that for a game of soldiers! Our polytunnel is still producing cherry toms....I'll stick with that!! It is, though, a wonderful bit of kit they've set up.... all power to their elbows!! We haven't tried the bambi burgers yet...a treat to come ..... and no walnuts in this valley at all this year! But Pauline's swapping hazelnut for walnuts in some recipes....our bushes were bountiful this year. I've got lots of hazels too, so I don't think I'll run out of nuts any time soon. Do you spray or otherwise treat your hazelnut bushes? Our hazelnuts are sparse, and the ones we do get are full of larvae. I read somewhere that you need to spray them with pesticides to kill the insects and larvae, or you need to strip all the grass around the trees so that birds can get to the offending insects and rid you of them. No, the trees get no attention at all. I do get hazelnut weevil, but not so much as to ruin the entire crop. I've got two coppiced mature trees that produce a good crop most years. It's taken me a long time to learn how to recognise a good nut when I'm harvesting and not come home with a bunch of empty shells, and I've learned to pick them or gather them slightly earlier than I used to. Same here...no attention at all... but again like Susan, Pauline picks them earlier too. We had the largest ever harvest this year....just short of ten kilos I think. Another of your great posts, Susan. Like the idea of vibrating bumble bees...it would be wonderful to walk through the greenhouses while all that buzzing is going on. We can buy bison burgers here, but the meat is very dry as a result of being strictly grass fed, which I would think might be the case with the venison. By the taste and appearance I suspect there is a generous addition of bacon to the burgers, which would solve the dryness problem. Very good article...and all so sophisticated.